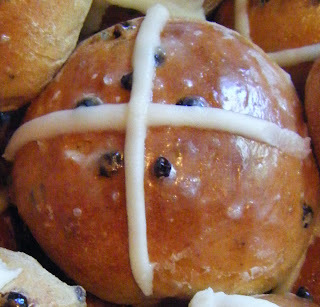 Anyway, as per last year I glazed them straight out of the oven with a sugar syrup, then piped on crosses with icing. It gives a nice sweet kick to the buns! I have indulged despite my low carb regime, I have restricted myself to a few and the rest have been given away. They were utterly delicious! Hope you have a happy Easter, I will have my nose in academic articles unfortunately, I have an assignment due next week which I really need to get on with. Carbs schmarbs, they look gorgeous! 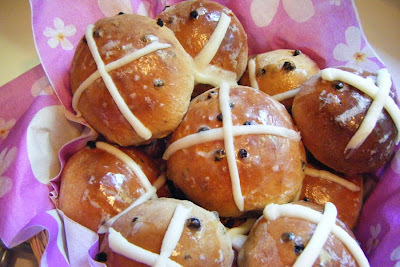 Can't wait to make some of my own on Sunday. Your blog is looking awesome, Linda! Being a Jamie fan myself, I really enjoyed reading your blog. A friend of mine introduced me to Jamie's recipe for butternut squash and duck breast. If you haven't tried it yet, do so as soon as you can. It is delicious. They look really lovely Linda sorry for not calling by sooner!